This is only the second episode of Tales From the Crypt produced, and it was directed by Robert Zemeckis (keep in mind this is Zemeckis in '89, back when he making the Back to the Future movies and still awesome; not the current Zemeckis who's been producing CG abominations). 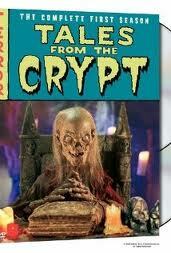 I saw a handful of episodes of Tales From the Crypt back in the day, but I certainly never watched religiously. Actually, I suspect I would have watched it religiously had I been able to, but I never had HBO growing up (this also means the episodes I did get to see were tragically edited for content). Lindsay tracked this down on Youtube, and we just finished watching it. I'm really, really glad we did: it was a lot of fun. The episode starts with a woman brutally murdering her husband for the insurance money while her daughter's asleep. When she tries to dispose of the body, an ax murderer dressed as Santa Claus shows up. As you can probably tell, there's not much in the way of plot here. The premise was adapted from a story which took up a quarter of an issue of Vault of Horror. They expanded it here by injecting some action in the middle of the story. Lindsay said she thought the extra bit hurt the ending, and I have to agree. The "twist" felt underwhelming given the extra action. Looking at scans from the issue, I get the feeling we're not supposed to feel too bad for the woman in the comic. Here, I was definitely rooting for her. Sure, she was a cold-blooded killer, but she was a hell of a fighter who took on some tough odds. I wanted her to win and get away with it. As you've probably guessed, that's not how this resolves. I appreciate that they were trying to be faithful to the source material, but that ending was intended for a shorter piece. It just doesn't work here. But that's a minor quibble, because overall I really enjoyed this thing. It's suspenseful, darkly hilarious, and campy in just the right way. The comedy hits its mark everywhere but the end. Throw in some fantastic direction from Zemeckis in his prime, and you've got something worth watching. I've seen quite a few Christmas horror movies for this blog, and this thirty minute episode buries the lot of them. Highly recommended to anyone who likes the genre. I'm considering tracking down some more episodes. I'd forgotten how good this show was.